Dragons: Titan Uprising is a puzzle RPG from Ludia Inc. It lets you build a team of ferocious fire-breathing creatures and fight the evil Dragonroot company. Based on the movie, How to Train Your Dragon, Titan Uprising’s gameplay is pretty straightforward. – you will have to match 3 or more rune stones to attack enemies. You will also be using your team’s special abilities to deal massive damage to enemies. Dragons: Titan Uprising has over 700 intense puzzle battle levels. As you fight various enemies, you will also be able to collect, train and breed over 100 creatures and recruit them to your battle squad. You can also build certain structures which produce key resources required to train and upgrade your dragons. Defeating dragons can be tough if you don’t know the right match-3 and team building strategies. With the help of these tips and hints, you will be able to complete more levels and choose the right creatures for your team. When matching 3 or more rune stones of the same color, pay attention to the position of enemy dragons. 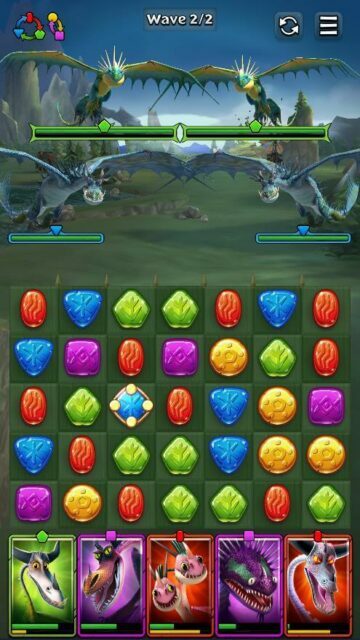 The stones you will be matching should be aligned with a particular dragon in order to attack him. If you want to attack an enemy dragon on the right side of the screen, you will have to look for potential matches on the same side. You can match 3 or more rune stones horizontally or vertically, just make sure that the stones and the enemy dragon are on the same side. You can also match stones on the center of the board to inflict damage to multiple dragons. Try this strategy when the battle begins. As soon as you defeat two out of four dragons, check the position of the surviving dragons. You will be wasting stones if you are matching runes on the left, when the dragons are positioned on the right. Matching stones that aren’t aligned with the surviving dragons should be the final course of action if you can’t find any matches on the correct side. You should then try to focus on matching the ones on the center or those that can fill the ability meter of your hero dragons. If you match red runes, it fills up the ability bar of red dragons. When a dragon skill is ready, his portrait glows. Just tap the enemy dragon you want to target and then tap your hero’s dragon’s portrait to unleash his ability. As you complete more and more levels in Dragons: Titan Uprising, you will be able to collect lots of dragons. You can select a team of dragons just before a battle begins. Your dragon squad selection should be based on the color of enemy dragons and the game’s suggested color. Check the “recommended” section on the upper right corner of the “versus” screen. If it’s red then select red dragons in your team. Along with the recommended section, check the type of enemy dragons you will be facing. If there are blue and green dragons, then you should add red and green dragons. Red is stronger than green and green is strong versus blue. When you match red rune stones located parallel to a green dragon, the damage this particular match deals will be more than normal rune stones matches. Please remember this sequence: Red > Green > Blue > Red when selecting hero dragons in your team. Look at the enemy lineup, and then choose a stronger team based on their background color. When battling dragons, check their color on their health bar. Now match those rune stones whose color is stronger versus their color. So, if there’s a fierce red dragon ready to attack, just look for a color match of blue stones to deal bonus damage to him. The sword icon beside the health bar of a dragon suggests that he is ready to attack. You can either choose a dragon with a charged ability of make a match of color-coded stones stronger than the enemy dragon’s color. Inspect abilities of all unlocked dragons before recruiting them to your battle squad. You can do this by tapping the decorative dragon icon on the lower-left corner of the screen and then long-tapping a dragon’s portrait to view his stats and abilities in detail. – Deals increased damage to an enemy for a certain number of turns. You will find more dragons with various abilities, but make sure you have those abilities in your starter team. You can add up to 5 dragons to your team. To do this, tap “Dragons” on the lower-left corner of the home screen and then press the “Edit Team” button. Tap a dragon to add him to the empty slot of your battle team. You can also tap a dragon to remove him from the team. In Dragons: Titans Uprising, special tiles clear several rune stones at once, which will ultimately launch a powerful attack on enemies. When you match 4 stones of the same color, you create a line blaster. Tap it to clear a row or column of stones. Check the arrows on the line blaster. The arrows suggest whether the line blaster will clear a row of stones or a column of stones. Make an L-shaped or a T-shaped match to create a bomb. This special tile clears surrounding stones in a square. Match 5 stones in a row or column to create a rainbow special tile. Now tap this special tile to clear all stones of that color on the same board. The rainbow tile takes the color of all 5 matched stones. If you match 5 green stones, you will create a green special tile. Now tap the special tile to clear green stones scattered all over the board. A new dragon acquired using a draft will always be in its infancy. You must train him first if you want to add him to your team. Training a new dragon not only makes him battle-ready, but also improves his stats and most importantly unlocks his special ability. You will need lots of fish to train a dragon. You might need lots more if you are training a rare dragon. Get fish as rewards when you complete a level. You can also farm fish at the fishery. Tap this structure in your home screen to collect fish. Upgrade fishery to increase fish production and storage. Watching a baby dragon grow once you train him is pretty cute. But now it’s time to level up a grown-up fire-breathing creature to further improve his stats, power and abilities. You will have to donate some dragons to level up one. Make sure you sacrifice duplicates or those that you don’t need. Start with one-star dragons or the ones that can’t be evolved further. 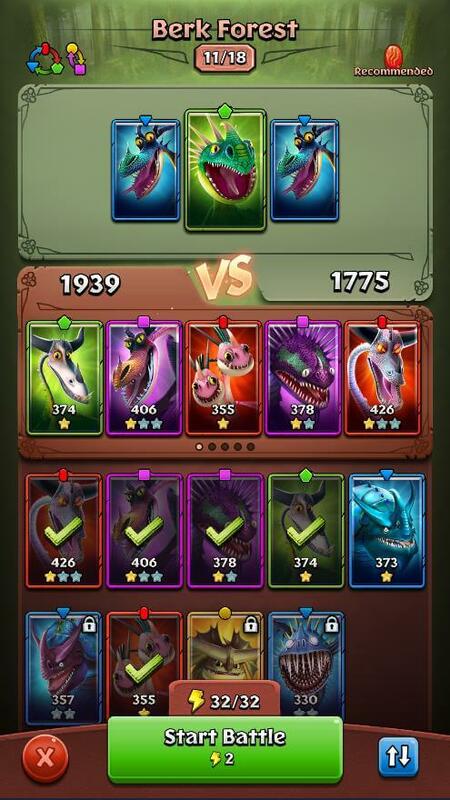 To upgrade a dragon, tap his portrait and then tap the “Level Up” button. You can sacrifice up to 10 dragons to level up your target dragon. You can’t choose those who are already in your team. Tip: You get bonus EXP when you select dragons with colors that matches with your target dragon. If your target dragon is red, then make sure you choose red dragons to level him up faster. Drafts let you obtain dragons. If you have pre-registered for Dragons: Titan Uprising, you will get a free premium draft that lets you acquire a guaranteed rare dragon. You can also get common drafts when you finish certain levels. Get a free dragon draft every 6 hours. 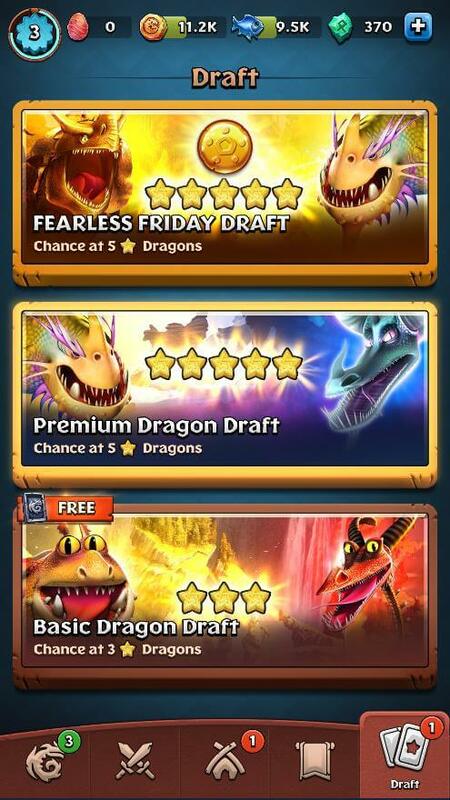 Tap the card icon on the lower-right corner of the screen and then tap the “Free” section to get a 2 or 3-star dragon. You can also acquire drafts using green runes. You can get these runes for free from the Viking chest or from certain important levels. You will also get 200 runes if you rate the game at the play store. Tap the envelope icon on your home screen and then tap “Terror Mail” to claim your premium drafts and free runes before they expire. 9. Should you Go for “Auto-Match”? The game’s auto-match mode lets the AI match rune stones and attack enemy dragons on your behalf. You can turn it on by tapping arrows on the upper-right corner of the screen. I have noticed that attacking is not very accurate and the usage of dragon ability is also random. There’s definitely some strategy involved in this game and with auto-battle mode it’s completely random, so expect more defeats than victories in each level. I would not recommend turning on auto-match mode in any level. 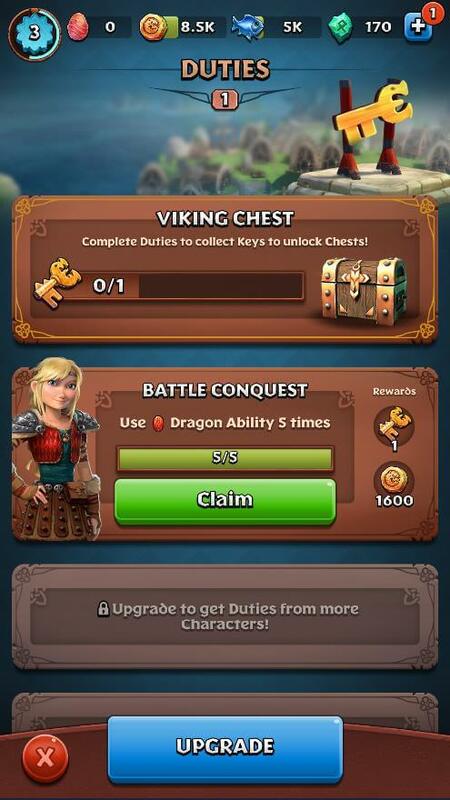 In Dragons: Titan Uprising, duties are nothing but missions that let you earn gold and keys, which can be used to open the “Viking’s Chest”. These missions range from using dragon abilities for a X number of times, defeating an X number of mini-bosses in any game mode etc. On your home screen, tap the large key icon to check what’s your current duty. When you complete a duty, you will get a key or a set of keys. You will have to keep completing duties to acquire 5 keys and only then you can open a chest. On opening a chest, you will receive your rewards. The game will then propose two Viking Chests – Easy and Hard. If you choose easy, then you will have to complete easy duties to get keys for a common chest. If you choose hard, the game will present a series of tough duties. You will have a hard time completing them but the rewards you will be getting for finishing those duties is worth the time spent completing them.